Multimedia is a technology which stores data as text, photo, animation, music, video, etc. and gives the method to collect and modify the data as required. Multimedia System : It is a system which has capability to integrate two or more types of media such as text, graphics, audio, video and animation. 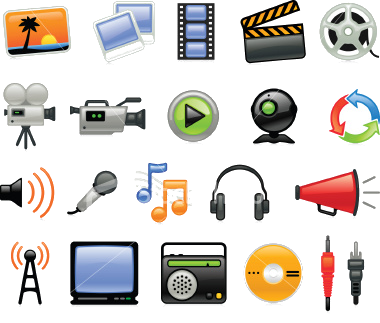 Multimedia Technology : Multimedia technology allows storing data and information for further reference. CD-ROM is a cheap, durable and portable storage media used to store data and information in the multimedia technology. It can be used to help the student and teacher to teach as well as to learn the given topics easily. It can be used to spread knowledge all over the world in a low cost. It can be used for any subjects and for anyone. Multimedia system are generally very interactive. So, it is interesting to use. Text: It is the primary component of multimedia. Most of the information can be presented with the help of text. We can be emphasized the text by using different fonts, colors, styles etc. Graphic: A digital representation of non-text information such as drawing, photographs etc are known as graphics. The graphic medium can be used with text medium. Audio: Audio is one of the important components of multimedia. It is music, speech or any other sound. It is normally combined with animation medium. Video: The effective medium for presenting information is video. It presents the moving images. It displayed the sequence of slightly varied pictures at the speed of 15-30 frames per second. Animation: The animation medium presents the sequence of still images of artwork at a rapid speed that looks like the image is moving. Multimedia technology allows storing data and information for further reference. The different components used in multimedia are text, graphic, audio, video, animation. What is multimedia? List any four multimedia CDs. List the components of multimedia. Explain shortly about them. The text is primary component of multimedia. Most of the information can be presented with the help of text. The text can be emphasized by using different fonts, fonts colors etc. A graphic medium is a digital representation of non-text information, such as drawing, charts or photographs. The graphic medium can be used with text medium. Audio is one of the important components of multimedia. It is music, speech, or any other sound. The audio medium is normally combined with animation medium. Video medium is the effective medium for presenting information. The video medium presents the moving images of real events. In the video, both sound and picture media are used for presenting information. The animation medium presents the sequence of still images of artwork at a rapid speed that looks like the image is moving. With the help of animation any event can be explained more clearly. What is multimedia computer? List the hardware components required in multimedia computer. The computer that has the capability to create multimedia products and can handle or present more than one medium simultaneously is known as multimedia computer. List any four common software that are used in producing multimedia. Why are multimedia products found only in CD-ROMs? CD-ROM is a cheap, durable and portable storage media used to store data and information in the multimedia technology. This is why multimedia products are found only in CD-ROMs. An artificial environment created with computer hardware and software and presented to user in such a way that is appears real is called _________. Which of the following statement is correct for Multimedia File? Multimedia system require hard, real time scheduling to _____________. Which one of the following resource is not necessarily required on a file server? Video displays the sequence of slightly varied pictures at the speed of ___________. Any Questions on 'Multimedia and Its Components '?